There is nothing in fashion that I love more than new clothes. I don’t pretend to stay on trend all year around, but I do love to invest in items that I don’t already own. I also love to buy new things for special occasions such as birthdays, weddings and christenings among them. If something is on trend and I think the style will suit me I will purchase it. When I had the opportunity to buy some clothes from the wonderful BooHoo I took it all in my stride! I was ordering in advance of wearing some of the items but confident in them still being fashionable in several months to come. And if not then who cares if you look and feel great in them. The one thing I think clothes should do is make you feel confident in yourself, right?! So what did I buy I hear you ask… Well… I bought a beautiful maxi dress for my summer shenanigans and a lovely long cardigan for cooler summer evenings. I have always been happy with everything that I have purchased so far from BooHoo.com. I find their clothes fit true to size and the quality is fantastic for the prices. 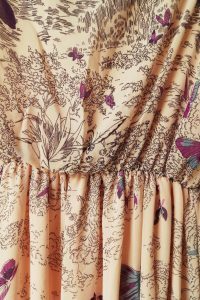 I have made many purchases in the past two years from this wonderful company, they mostly include dresses because the quality and choice is excellent. However this time I treated myself to something a bit different. In this post today I’m going to review the items I have purchased recently, with photographs of me wearing them included in this review. 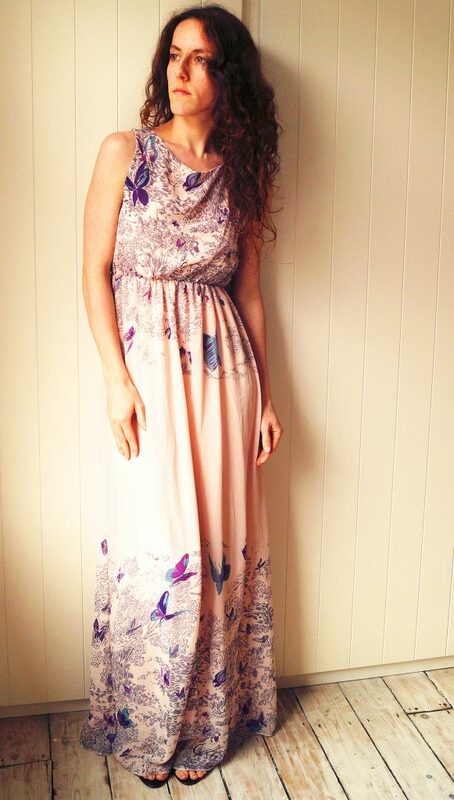 So first up is the stunning ‘Rachel Tie Back Border Print Maxi Dress’ with a beautiful butterfly and floral pattern. This stunning piece is lightweight which is ideal for summer and comes with enough detail to make you feel like you need very little accessories. I would pair this with wedge shoes or strapped sandals with one of my arms filled with bangles. 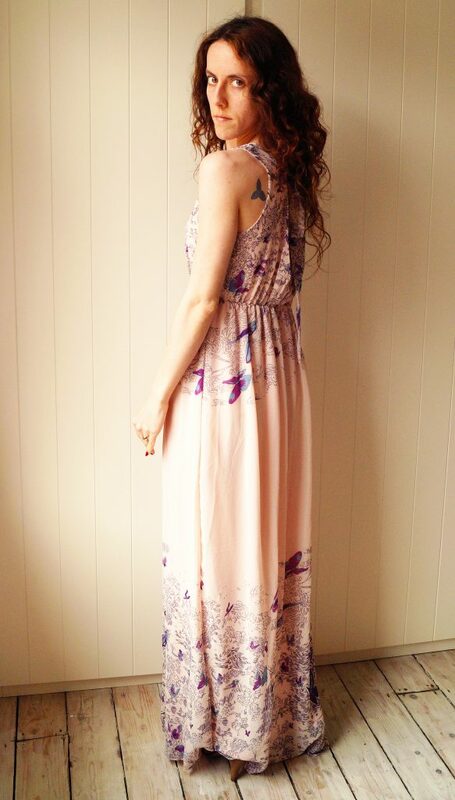 The only thing that is a little annoying about the material used for this maxi dress is that it creases easily. It can be cool ironed only, and even when I did that some creases wouldn’t come out completely. I recommend hanging it up at all times while it’s not in use, and to cool iron soon after every wear and wash to ensure no lasting lines. This is the only downside to the dress, because the detail is wonderful and the shape is very flattering, even to someone slim like myself. There is so much to see on this piece, you find your eyes wandering over the entire piece and you aren’t focusing on one area. The second piece of clothing I’m reviewing is this stunning Wine coloured ‘Rosie Longline Jersey Basic Cardigan’ paired with a boohoo crop top. I always like to throw on cardigans when my arms get cold. There is something very comforting about long sleeved clothing, and when the fabric is as long as this is, it’s not only warming but it’s also fashionable! So I paired this piece with a crop top and some skinny jeans. When the warmer months appear it will be worn with shorts and crop tops. Such a versatile item of clothing I look forward to seeing all the outfits that I can pair it with. I also chose this colour because I love deep shades; they go well with both light and dark outfits. This cardigan will need ironing frequently and when being washed it would need to hang to dry to avoid getting misshapen. Other than that I cannot fault it’s soft material and almost perfect length of arms and body. For anyone who is interested in purchasing these pieces of clothing they are all still available on the BooHoo website. If anyone is wondering about my details I am a size 8 and of height 5 ft 3.5 “. So if you are taller than me these items will appear differently on your figure. Always take into consideration your height when ordering dresses. For example I cannot wear the beautiful maxi dress without a 2” or more heel, something to consider when buying if you don’t like wearing high heeled shoes. 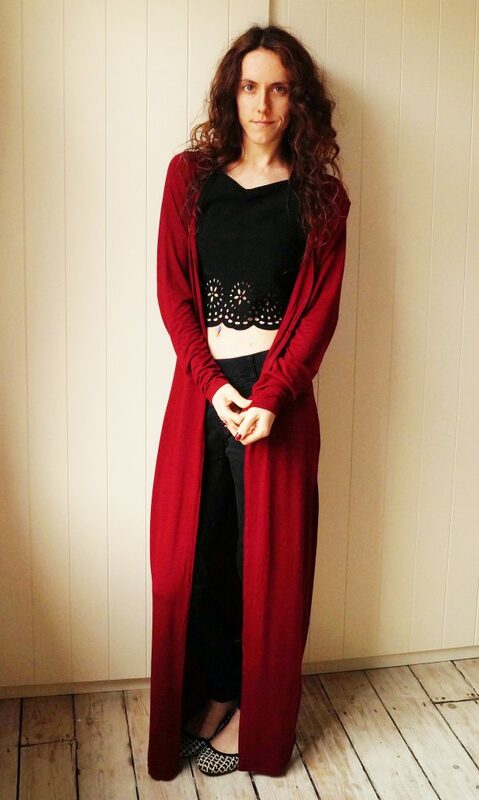 This entry was posted in BooHoo, Clothing, Fashion, Fashion & Beauty, Reviews by Sabrina. Bookmark the permalink. Love the dress! So gorgeous.